We think of cement and concrete as modern materials when in fact they are very ancient materials. We do not know when people first found out that burnt lime, or burnt gypsum, mixed with water, set hard into a cement. Egyptian builders used gypsum cement four and a half thousand years ago. Cement was really a kind of paste which could be used to bind together stones or bricks and so build walls. Often sand was added to thin out the expensive cement. When other substances, such as gravel, or lumps of broken pottery or brick were added, the mixture was called concrete. Carefully and thoroughly stirred so that the cement and water coated everything in the mixture, concrete set as hard as natural stone. The Romans discovered that if they added a fine, chocolate-red volcanic earth called pozzolana to lime, it made an extremely useful cement which set under water and was fire-resistant. Concrete made from this cement became a common building material in Imperial Rome, especially for large important buildings. 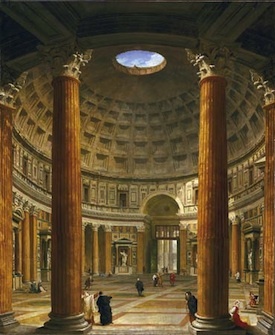 The Romans’ marvelous feats of construction with concrete were not equalled again until the industrial revolution forced men to re-think techniques of building. For, although cement and concrete are such ancient materials, they are also very modern. The trouble was no one really understood why cement worked. People left its making and mixing to trial and error. Sometimes medieval builders found their cement good and strong, at other times it crumbled disastrously. In fact, the chemical reactions involved in the making and setting of cement are most complicated and have only recently been understood. Once men began to study the whys and hows of cement and concrete, new developments and important inventions came about that have made these materials indispensable to today’s construction industry. Cement and concrete have almost unlimited uses, and engineers, architects and designers keep extending their possibilities. Highways, bridges, dams, skyscrapers – the new shapes of architecture and engineering – all come from modern uses of these ancient materials. 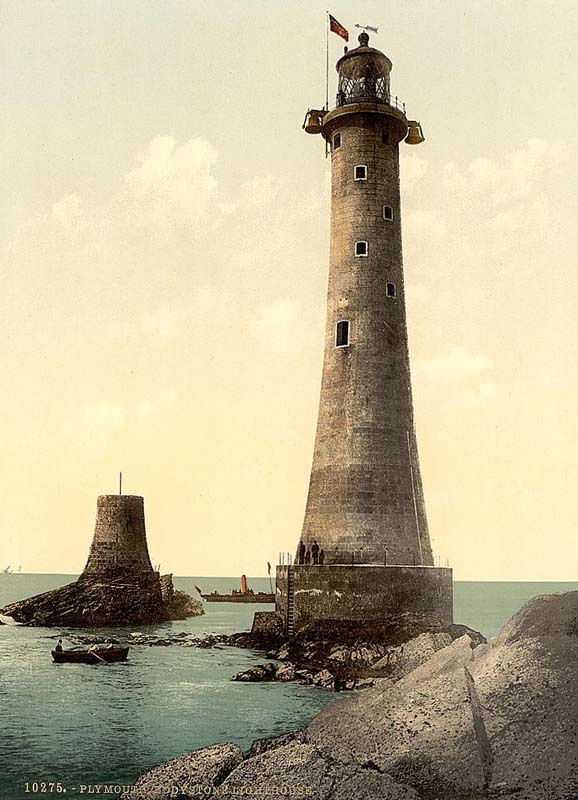 About two hundred years ago John Smeaton was given the job of rebuilding the Eddystone lighthouse in the English Channel. Smeaton decided he needed the best cement available, to stand up to the pounding of the seas, so he collected samples of limestone from all over the country, tested them for strength and chemically analysed them. Smeaton discovered that limestone containing a lot of clay made the most waterproof cement. Many new cements were developed from his research. The best-known was Roman cement, so called because people thought it made concrete as hard as the concrete in buildings left over from the Roman occupation of Britain. In 1824 an important cement was patented by a Yorkshire builder called Joseph Aspdin. Instead of trying to find a clayey limestone as Smeaton had, Aspdin collected clay from one place, limestone from another, ground them, heated them to a very high temperature in a kiln, and re-ground the resulting hard-burnt clinker into a powder. Aspdin called his invention Portland cement, because he wanted to suggest that its dull-grey colour resembled the famous Portland stone used in many London buildings. Portland cement might then be used to replace Portland stone. Aspdin’s son William started to manufacture the cement on a large scale. Portland cement became the most important modern cement, exported all over the world. It got a real testing when the Metropolitan Water Board decided to use it in the middle of the 19th century to build London’s drainage system, a job which took seventeen years. Proper sewers and drains for cities were part of the needs of the fast-changing industrial society of the 19th century. With the great expansion of trade and manufacture, people and things had to be transported more efficiency. The old, unsealed road ending in a ford across a river was no longer good enough. Bridges must be built, as well as better roads, canals, tunnels, embankments for the new railways, and new harbour facilities – breakwaters, docks, quays – for more ships. All this meant reliable, high-quality cement and concrete capable of being used as a structural material in complex engineering works. Concrete is immensely strong and can stand great direct pressure; it has compressive strength. But bend concrete and it cracks and breaks. It is not flexible; it does not have what is called tensile strength. In the middle of the 18th century several Frenchmen tried to get around this problem by embedding iron rods in concrete. A young French lawyer, Jean-Louis Lambot, and later a man called Joseph Monier made water containers and tubs for fruit-trees in this way. Some French builders had already tried laying wrought-iron rods in ceiling plaster to make it stronger, and an English builder, W. B. Wilkinson, tried reinforcing concrete beams with secondhand mining cable. Monier took out a patent in 1867 for his reinforced concrete. His system worked because he used Portland cement, which was practically waterproof, and he made certain that a thick layer of concrete covered the reinforcing iron rods. In this way moisture could not creep through the concrete to rust the embedded iron and force the concrete apart. Gradually, designers and engineers began to use this revolutionary new material. Reinforced concrete had the compressive strength of concrete (it could withstand great direct pressure) married to the tensile strength of iron or steel (it was more flexible). But now the engineers needed to learn very precisely how steel and concrete worked together. In the early 1930s another Frenchman, Eugene Freyssinet, developed pre-stressed concrete. Steel wire was stretched while concrete was added, then allowed to set under pressure. The result was an even stronger, more flexible and resilient concrete. Pre-stressed concrete was particularly suitable for leaping single-span bridges, domes on slender supports, and ‘floating’ roofs. In about 1849 Jean-Louis Lambot decided to replace the little wooden rowing-boat on the lake in his garden, because its timbers were rotting away. He built a boat of cement, reinforced with wire netting and iron bars. Then he built a better model, and the two boats floated on the lake under the hot sun of southern France for a hundred years, while children played in them. Lambot patented his techniques, but nothing came of them. ‘Nothing floats like cement,’ claim the enthusiasts. A lump of cement or a bar of iron will sink to the bottom of the ocean. But combine them, and they can make a boat more satisfactory in many ways than a wooden one. That menace of ships, the marine borer, cannot worm its way into concrete, nor can rot and corrosion. A cement boat does not have to be hauled up regularly, scraped down and caulked as a wooden boat does. It is fireproof, and if it is holed it can easily be repaired. Most importantly, cement boats can be made much more easily and cheaply. The boat-builders do not need to be as skilled, and the materials are always available. They are part of any building industry: sand, cement, wire mesh, steel or iron rod, tie wire and water. In 1968 a United Nations boat-building expert was in Thailand designing and building a prototype cement boat for the Thai fishing industry. First, the skeleton of the boat was shaped out of ordinary water-piping and interwoven with a framework of flexible iron rods. Then wire mesh was tied on to the rods like a skin, four layers on the inside, four layers on the outside. Lastly, the cement mortar was added, a process rather like plastering. One man pushed it through the layers of mesh from the inside, making sure the cement filled all the spaces. A second man smoothed it off on the outside, watching that no bits of metal stuck through, and being careful that the cement covered the mesh evenly and was no thicker than an eighth of an inch. With this technique the cement layer covering the mesh must be very thin, or the surface will crack and break. The completed hull of the fifty-two-foot fishing vessel took about seventeen days to dry or ‘cure’, although it would keep on increasing in strength over the years. Then the boat was painted, and superstructure such as engine, deckhouse and storage tanks added. The ideas behind this technique are simple. The great Italian structural engineer Pier Luigi Nervi worked them out early in the Second World War, following on in many ways from Jean-Louis Lambot’s pioneer boat. Nervi found that if, instead of separate metal rods, soft iron wire mesh is used to reinforce concrete, extremely thin slabs can be cast into almost any shape and remain strong and highly flexible. The tensile strength of concrete is increased, the more the metal which reinforces it is divided up: this is why wire mesh is used. Nervi said the new material was like ‘melted stone’; he called it ferrocemento. Lambot had called his method ferciment. It is known today as ferro-cement; and an increasing number of ferro-cement boats are finding their way on to the world’s lakes and oceans.